Fr Brown is humble, humorous, and down-to-earth. 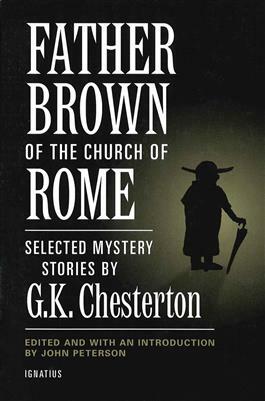 This priest created by G.K. Chesterton is anything but a Sherlock Holmes. Never boasting or proclaiming himself the hero of any of the mysteries he solves, this humble priest keeps his discoveries to himself. When a clue suddenly hits him he waits until he is sure that his hypothesis is true before he tells the others his solution. Oftentimes, Fr Brown, himself is accused of the crime. He never lets his pride get the best of him by acting insulted or declaring that he is a priest and should not be accused of such things. Instead he tells his accusers that he well may be suspected just as much as the next man. Always keeping his sense of humor even when solving mysteries, Father Brown often bursts into peals of laughter. People sometimes think that maybe he is a little crazy, but he brings many a hearty laugh to all his friends. He doesn’t think himself too saintly as to keep away and not join in on the fun. If he is not himself the cause of the laughter, he is always in the midst of it. Whenever he is told of a mystery that has occurred, he never starts panicking and pointing fingers. His down-to-earth nature causes him to immediately look for clues and quietly observe all that is around him. In the end, when the mystery is clear to him, he tells everyone else what happened. Then, he leaves before anyone has the chance to praise him. Most of the Fr. Brown stories are great to read. What makes these stories timeless and ever appealing is the main character's humility and humorous, down-to-earth personality. That and the thrill of a mystery. In the Curse of the Golden Cross, Fr. Brown helps Professor Smaill realize that he is going through life with a persecuted mentality. He must overcome this mentality in order to have joy and love back in his life. Professor Smaill relates a story of a man who's identity is unknown but is stalking him and threatening to kill him. He tells Fr. Brown that anyone could be that man. Professor Smaill felt as though he was always looking over his shoulder and always looking for faults in others. This made his life miserable. When Smaill gets his head slammed by the coffin lid, everyone stands and stares, thinking of the curse and fearing who would be next to die. All that is but Fr. Brown, who is immediately at the side of the hurt man. Fr. Brown's simplicity and selflessness shine through. Self-seeking, the others immediate thoughts were upon themselves instead of the injured man. A little while later, Fr. Brown solves the mystery and gets almost annoyed at everyone else's complicated minds that do not just think of what could have happened. Instead, everyone looks at what is almost impossible and believes it to be the truth. Fr. Brown points out that they all know more about foreign cultures than they do about their own. He found it disappointing how little they knew their own culture, for if they did, they would have discovered the solution to the mystery as well. The Curse of the Golden is a wonderful example of Fr. Brown's simplicity and selflessness. It also conveys Chesterton's observation that we are more likely to believe what the media tells us is true than what common sense and our ties to the past can teach us. In the Red Moon of Meru, Fr. Brown shows how completely different Western culture is from Eastern culture. The story opens with a quarrel between Lady Mounteagle, the host of the bazaar, Tommy Hunter, her cousin, and James Hardcastle, a politician. They soon run into Fr. Brown, who is playing with the children. Hinting toward the humility and child-like nature Fr. Brown possesses. They then go in search of the Master of the Mountain, a Hindu religious leader who Lady and Lord Mounteagle are housing. They enter the Mounteagle's house, a former abbey, and there they first set eyes on the Red Moon of Meru, a large ruby. Though it may have bothered Fr. Brown to see an abbey being treated so ill, he humbly makes no protest to the fact that an old abbeys is now home to pagan gods. Lord Mounteagle tells the tale of the ruby and then sets it down on the window seal. Tommy gets annoyed with Professor Phroso, who reads people's bumps--that is head bumps. Tommy then runs out of the room. At the same instant the ruby is stolen! Tommy grabs the Master and exclaims that he has caught the thief. Everyone panics and searches for the stone. After searching the Master without success, they all scatter and search elsewhere with the same profits. The Master then seizes his chance to prove a magician and claims that he has used his "great spiritual powers" to make it go flying back to the Mountain. The real thief then returns the gem and the Master states that he has made it come flying back. His "powers" are then praised and he sits and smiles, extremely enjoying himself. While the Master of the Mountain is taking credit for the "miracle", The real theif, at a suggestion from Fr. Brown, puts the gem he has stolen back before he is discovered. Here, Fr. Brown's attitude is again down-to-earth as he secretly tells the thief to undo the mischief that has been caused. "One was sorry he'd done it while the other was sorry he hadn't." Fr. Brown again displays a humble and down-to-earth attitude. He does not point out that the abbey had also been stolen until the end. He does not accuse the Mounteagles directly but quietly states that it like the ruby was a stolen stone alluding to the days of Henry XIII. This is a quick but masterfully told story that shows the vast differences in Eastern and Western "spirituality". Not all religions are equal. Thank you, G.K. Chesterton.